We are right in the middle of CES 2010, which naturally means it's a great time for tons of product announcements. Intel and their partners are busy launching the new i3/i5 processors, and AMD is taking this opportunity to announce the next version of their Mobility Radeon lineup. Yesterday, we discussed NVIDIA's quiet launch of the GT 240, and while we weren't impressed with the price/performance offered, at least we were able to get some hardware to test. As with most mobile GPU "launches", all we have right now are specifications and features. We will have to wait to get some laptops before we can provide concrete performance numbers. With or without independent performance, today ATI is announcing their new 5000 series DX11 mobile GPUs. Performance with ATI's mobile graphics chips has generally been competitive with NVIDIA products in recent years. In fact, ATI is keen to point out that their market share for discrete mGPUs has increased to over 60% in 2009, with a whopping 13% increase in 2Q09. 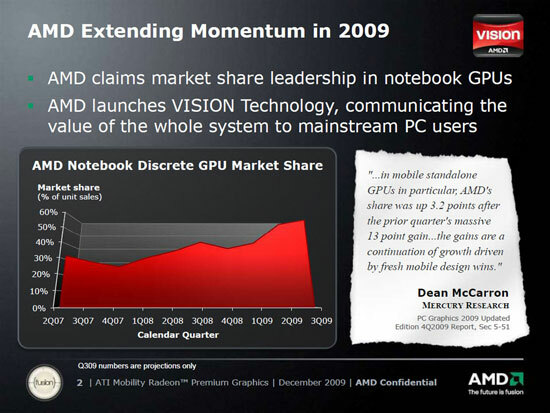 Since NVIDIA is the only other discrete mobile graphics solution, ATI's win is NVIDIA's loss. That of course doesn't tell the full story, and in speaking with ATI we were informed that 70% of sales have been 4300/4500 parts - the lowest performing, least expensive offerings. 15% of sales are from the 4600 series, which is where reasonable gaming can finally enter the picture. As for the 4800 series, it's still sitting at less than 5% (with the remainder of ATI's sales apparently coming from older 3000 series parts). NVIDIA also sells far more low-end and midrange mobile GPUs than high-end parts, but as far as high-end laptop graphics is concerned, NVIDIA has had a clear lead for a while, for a couple of reasons. First, NVIDIA has been very good about OEM/ODM design wins for their fastest GPUs. In contrast, we are only aware of two laptops that shipped with the Mobility Radeon 4870 chips. We're still running G92b cores in the GTX 280M, and the G92 first became available almost 2 years ago with the 8800M series. With only minor tweaks to the design, it has been easy for manufacturers to update existing lines with support for new NVIDIA graphics solutions. We've seen Gateway, ASUS, Dell, Clevo, and others go from 8800M to 9800M to GTX 260M/280M with very few updates to accommodate the new GPUs. That's good for the manufacturers, but we're not particularly happy that laptops are still less than half the performance of desktop parts. Then again, it's difficult to deal with laptop power and cooling constraints. The other big reason that NVIDIA has ruled the high-end of mobile solutions is driver support. We tested the ASUS W90Vp and found that it can offer compelling performance… when the drivers worked properly. This is especially important for CrossFire and SLI solutions, and that's the one area where ATI's Mobility Radeon drivers have been severely lacking. (And as a side note, we still haven't seen much in the way of driver updates for that platform!) We asked ATI about this and were told that an improved mobile driver plan should be coming "very soon". Frankly, if the Mobility Radeon 5800 series is going to have any chance at winning gamer mindshare, those plans can't come soon enough. And of course, NVIDIA also has CUDA and PhysX to talk about. ATI in turn has Stream, and DirectCompute and OpenCL are industry standards that will hopefully supersede CUDA and Stream, but for the time being we have to give the GPGPU crown to NVIDIA. In short, while ATI has had very compelling performance on the desktop - in fact they have been our recommended solution with the 5000 series, and the 4000 series was very good from a price/performance standpoint - on laptops ATI has been more of a multimedia solution than a gaming solution. That's fine and ATI is clearly getting design wins, but don't try to convince us that low-end discrete graphics (HD 4330 and GeForce 9300M/G110M, we're looking at you!) are anywhere near being good gaming solutions. At best, they are barely adequate, capable of running the majority of games at 1366x768 and low detail settings. If that's all you need, or if you don't even need gaming performance and are just interested in multimedia solutions, forget about discrete graphics and go with an IGP. Okay, enough talk about the past; let's look at what AMD is announcing today. What we really want to know is if performance and compatibility are going to be where we want. Unfortunately, all we have are some figures from ATI regarding gaming performance, and until we see updated driver plans we won't know what to expect in terms of compatibility. But then drivers have only really been important if you're running high-end solutions, which is less than 5% of the laptop market. Does anyone have a hint if these are immediately available? Dell is already selling the new i5 chips but still old video cards. This is what you get when the other mob is rehashing years old tech. I have spent the last two months in driver hell trying to get two external monitors hooked up to an HP 4510s laptop with a ATI Mobility Radeon HD 4330 for an accounting firm. The laptop has an analog and HDMI output, but you can't use both at the same time. So that leaves USB-based DisplayLink adapters. DisplayLink drivers are the worst on the planet and conflict with HP's video driver. You can't use ATI's official driver without hacking it first with Mobility Modder. If you do that, HP's QuickLaunch application will blue screen. If you remove QuickLaunch, you can't control whether your laptop screen or the other ATI video output is the primary screen, nor can you turn the secondary display on/off. Argh! There is no end to the frustration! The problem is with the users not the laptops. For one, I find it hard to justify two monitors let alone three, that is what alt-tab is for. Your brain/eyes can't focus on more than one monitor at a time anyway. People who think multi-display lets them become some superhuman multitasker are fooling themselves. If they still demand three monitors, they should be using a desktop not a laptop. I think most users wouldn't have the need for a 2nd or even 3rd monitor for their laptop use but in my case I must have a 2nd and more importantly bigger and larger resolution. My 17" laptop with 1920x1200 doesn't cut it with my spreadsheets. And although the resolution is nice things are tiny and while you can blow things up, that defeats the purpose of having more things in the same amount of space. Total BS, If you believe you can only focus on one monitor at a time why don't you cut a 24 inch hole in a box that is about an arms length deep so all you can see through is the hole in the box.